The Southern Oral History Program is delighted to partner with the Carolina Women’s Center, the History Department, and the Women’s Studies Department, to sponsor The Moxie Project at UNC: Women and Leadership for Social Change. The Moxie Project represents an ambitious collaboration that deepens the SOHP’s involvement with undergraduates and strengthens our ties with academic departments at UNC as well as with community organizations in our area. It builds on our long tradition of collecting oral histories with women activists across the South, and will put those histories in the service of preparing a new generation of leaders who will have a deep understanding of the historical role women have played in the region, as well as of the challenges and opportunities facing their state and country. 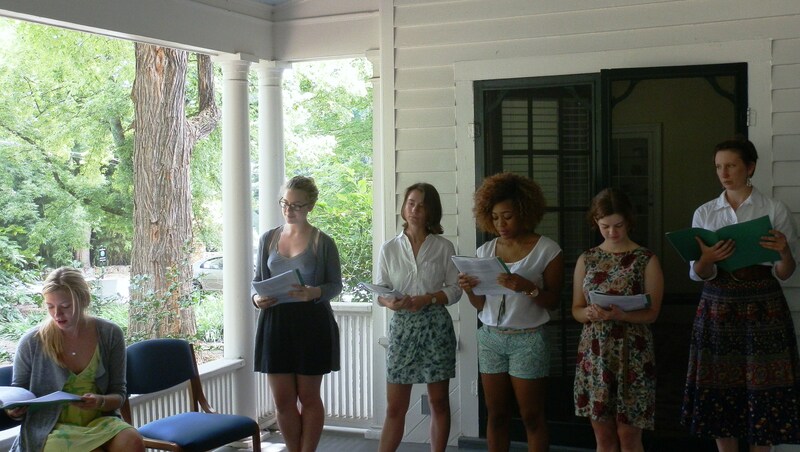 Moxie Scholars study the history of women’s activism, and then spend the summer in paid internships in women’s organizations in the Triangle. While interning, the students interview women activists, and those interviews are included in our collection. The students also meet once a week for a summer seminar. They reflect on their experiences and create a final project based on their oral histories, observations in their organizations, and research. Click here to watch the Moxie scholars’ performance from summer 2013, based on the oral history interviews they completed with women activists from North Carolina. For more information, visit the Moxie Scholars’ website; sign up to receive the Moxie Project newsletter, “Moxie Memos”; and “like” The Moxie Project on Facebook!